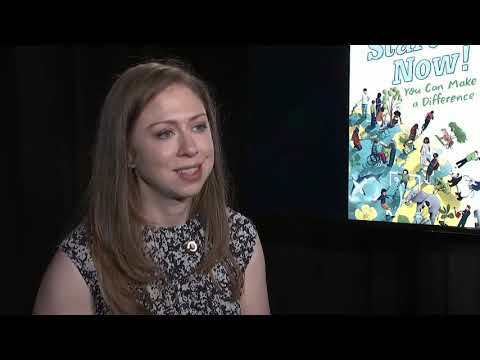 NEW YORK (AP) — Chelsea Clinton's career as a children's author continues with a picture book about endangered animals. 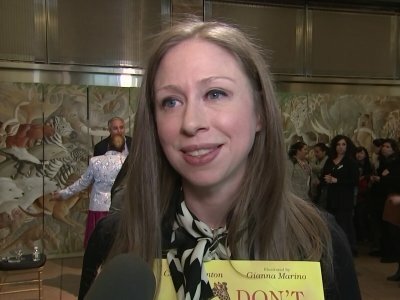 Penguin Young Readers announced Monday that the daughter of Bill and Hillary Clinton is collaborating with illustrator Gianna Marino on "Don't Let Them Disappear." Scheduled for April 2, the book will celebrate whales, tigers and other animals and provide advice on how to help preserve them. NEW YORK (AP) — Chelsea Clinton says she's naturally an optimist and despite enduring name-calling from the time she was a child, she chooses to answer insults — even on Twitter — with kindness and respect. POCATELLO, Idaho (AP) — An Idaho state representative is being criticized for what critics say was a threatening social media message directed at young students protesting the state GOP convention. "Fuzzy picture but i love it. Kate and I during Christmas family photos. We had so much fun that day. She was so sharp and quick on her feet. She could make me laugh so hard. I still cant believe it. Its a rough world out there people, try to hang on." — Brother-in-law and comedian David Spade, via Instagram. After Kate Spade's death by apparent suicide on Tuesday, fans mourned the designer and thanked her for fashion that marked formative moments in their lives. For some, Spade's purses posed as protection from outside scrutiny. For others, they were an anecdote in greater love stories, a gift that represented so much more. For still others, they were a first splurge after getting a raise, or rewards for a job well done. Britney Spears tweeted good luck wishes Adam Rippon’s way Friday afternoon. She told him he was “the most fun” part of the Olympics. Earlier this week, Reese Witherspoon asked him to keep making everybody happy. And Zach Braff said he wanted to tattoo the words of one of Rippon’s inspiring, fun-loving tweets on his chest. And Chelsea Clinton thanked him for his “grace, graciousness and glamour.” And Elmo, best of all, called Rippon a friend, told him he was proud of him. Britney Spears tweeted good luck wishes Adam Rippon’s way Friday afternoon. Told him he was “the most fun” part of the Olympics. OCALA, Fla. (AP) — A federal prison inmate in Florida who previously received five years for threatening to kill then-President Barack Obama and others has been sentenced to another four years and three months for threatening to kill President Donald Trump. Court records show Richard Jeremy Ware was sentenced Monday. He pleaded guilty in October to making threats against the president. 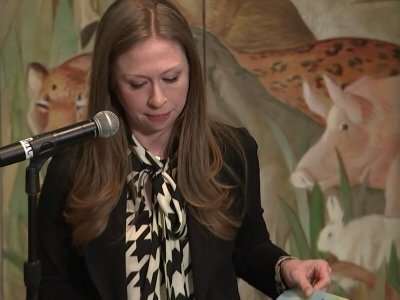 According to the reporter, Chelsea “looked straight ahead and ignored the questions as she scurried through the side lot and ducked into her waiting black sedan.” Security further blocked the reporter from asking Chelsea the question again. 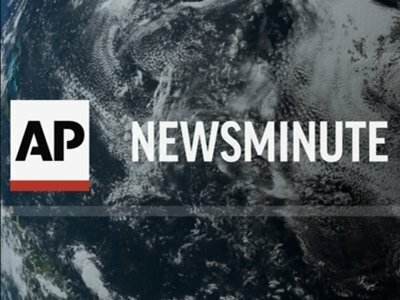 NEW YORK (AP) — It's been one epic year for women, a notion definitely not lost on Glamour magazine as it named U.S. Rep. Maxine Waters, 27 key facilitators of the Women's March on Washington and astronaut Peggy Whitson among its women of the year from the worlds of politics, entertainment, fashion, business and more. Colton Haynes has got married. The 29-year-old actor wed his partner Jeff Leatham in a romantic ceremony in Palm Springs, California, on Friday (27.10.17), and the pair co-ordinated their outfits on their special day, which saw them both don white suits paired with black bow ties, PEOPLE has reported. OCALA, Fla. (AP) — A federal prison inmate in Florida who previously received five years for threatening to kill then-President Barack Obama and others has pleaded guilty to threatening to kill President Donald Trump. Court records show 42-year-old Richard Jeremy Ware pleaded guilty Wednesday to making threats against the president. He faces up to five more years in federal prison. BOSTON (AP) — A leadership conference created by former President Bill Clinton is bringing hundreds of college students from across the country to Boston this weekend. Northeastern University is hosting the 10th annual Clinton Global Initiative University meeting, which gathers students and experts in a variety of fields to discuss solutions to world problems. BOSTON (AP) — Former President Bill Clinton is visiting Northeastern University for a student conference that's meant to inspire future leaders. Clinton is scheduled to speak at the Boston campus on Friday during the opening session of an annual event known as the Clinton Global Initiative University meeting. The event runs through Oct. 15 and is meant to connect students with experts on topics including education, climate change and public health. NEW YORK (AP) — Tina Charles scored 26 points and the New York Liberty overcame Erica Wheeler's 33 points for an 81-76 victory over the Indiana Fever on Tuesday night. Wheeler made two of her seven 3-pointers in the final 20 seconds. Charles answered the first with two free throws for a 79-73 lead, and Epiphanny Prince made two more with 13 seconds left to seal the win. Shavonte Zellous added 16 points for New York (13-12), including 10 of the Liberty's 27 made free throws. Foolish optimists expected Ivanka Trump to be a moderating force in the White House. But by now it should be clear that she’s not part of any solution, which by definition means she’s part of the problem. WASHINGTON (AP) — President Donald Trump is defending a decision to have his daughter briefly sit in for him at a table with world leaders at an international summit. A Russian delegate tweeted a photo of Ivanka Trump in her father's seat at the Group of 20 summit in Hamburg, Germany, Saturday, sparking criticism from those who felt the move was inappropriate. But German Chancellor Angela Merkel brushed it off, saying it was perfectly normal. Philippine President Rodrigo Duterte lashed out at the daughter of former U.S. President Bill Clinton in an expletive-laden speech for a second straight day Thursday after she criticized a comment he made about rapes committed by soldiers. Allow us to add our voice to the broad (if not universal) chorus of outrage over the photograph of stand-up comedian Kathy Griffin holding a prop Donald Trump severed head. It is vile, it is tasteless, and it is shameful. And it has been condemned by just about everyone who has seen it, from President Trump to Chelsea Clinton to Griffin herself — her video apology may be the fastest and most thorough act of contrition witnessed on social media this year, unfolding in a matter of hours Tuesday. MANILA, Philippines (AP) — Philippine President Rodrigo Duterte lashed out at the daughter of former U.S. President Bill Clinton in an expletive-laden speech for a second straight day Thursday after she criticized a comment he made about rapes committed by soldiers. Embattled comedian Kathy Griffin may have succeeded in making herself even more despised than the target of her vile stunt this week, but her career isn’t over. MANILA, Philippines (AP) — Philippine President Rodrigo Duterte denounced the daughter of former U.S. President Bill Clinton on Wednesday after she criticized a comment he made about rapes committed by soldiers. In an expletive-laden speech at a navy event, Duterte asked Chelsea Clinton if she also criticized her father when he had an affair with Monika Lewinsky in the White House when he was president of the United States. NEW YORK (AP) — Chelsea Clinton stayed away from politics and stuck to the subject of childhood obesity Friday at a Variety magazine event honoring prominent women and their charity work — except for her last line. NEW YORK (AP) — Congresswoman Clinton? President Clinton? 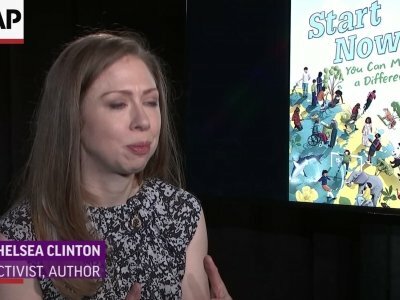 For now, Chelsea Clinton insists she's focused far less on her political future than on burnishing her profile as an author of children's books. The new book is designed “to give readers a deep understanding of the world around them and how anyone can make a difference.” Clinton includes many anecdotes on children and teens who have helped to make changes in their families, their communities, the country and the world. NEW YORK (AP) — Jessica Chastain, Chelsea Clinton, Gayle King, Blake Lively, Audra McDonald and Viacom vice chairwoman Shari Redstone are being recognized by Variety at its Power of Women: New York luncheon. The Hollywood trade publication announced Monday that the six women will be honored April 21 at the Cipriani restaurant in New York. "Saturday Night Live" star Vanessa Bayer will host the private event. The honorees will appear on the cover of Variety's April 18 issue. So the rumor mill is going gaga over Chelsea Clinton running for the U.S. Senate. Is she qualified? Will she actually run? Could she win? They must be at least 30 years old. They must have been citizens of the United States for at least the past nine years. NEW YORK (AP) — Chelsea Clinton is joining the board of directors of online travel booking site Expedia. Documents filed with securities regulators say the daughter of defeated U.S. presidential candidate Hillary Clinton has joined its 14-member board. The company is controlled by Barry Diller. Chelsea Clinton is also a director of another company that Diller controls, IAC/InterActiveCorp. NEW YORK (AP) — Chelsea Clinton has written a children's book, with a sharply worded title. The book is called "She Persisted" and comes out May 30, Penguin Young Readers announced Thursday. Clinton will honor 13 American women "who never take no for an answer," including Harriet Tubman, Sonia Sotomayor and Oprah Winfrey. "She Persisted" will also feature a "special" and unidentified cameo, presumably Clinton's mother, Hillary Clinton. The book will be illustrated by Alexandra Boiger. NEW YORK (AP) — A "Saturday Night Live" writer has been suspended indefinitely after tweeting a poorly received joke about Donald Trump's 10-year-old youngest son, Barron. 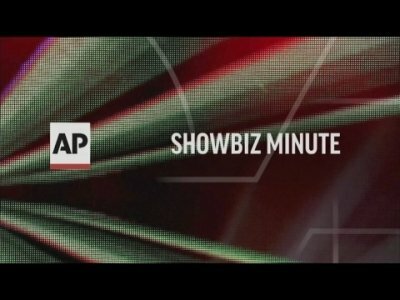 A person familiar with the situation but not authorized to speak publicly told The Associated Press that Katie Rich was suspended immediately after writing an offensive tweet about the child. An outcry on social media followed, with many calling for a boycott of the TV show. But the chants from the few male protesters did little to rile the Hillary Clinton supporters who turned up for the Aurora event Tuesday evening. According to sign-in sheets, about 400 people turned up for the event. LANSING, Mich. (AP) — Hillary Clinton is confident Michigan will remain reliably Democratic, while Donald Trump is hoping he is the presidential nominee who can finally carry the state for Republicans again. Tuesday's election also will cap two close U.S. House races at opposite ends of the state and a closely watched battle for control of one-half of the GOP-led Legislature — the outcome of which will influence Gov. Rick Snyder's last two terms in office. Hillary Clinton and Donald Trump filled their Mondays with stops in swing states on the last day of the 2016 presidential race. Clinton's campaign was buoyed Sunday by the FBI's announcement that it had finished its examination of new emails and repeated that there would be no effort to seek charges against her. Democratic presidential nominee Hillary Clinton will hold a final midnight "Get Out the Vote" rally in Raleigh on Monday, according to her campaign. According to a news release, Clinton will lay out her plans to create an economy that works for everyone, and her vision for an America that is stronger together. The final day of early in-person voting in North Carolina is bringing urgency to the presidential battleground state and attracting a wave of volunteers to get people to the polls. Interest groups of all political stripes are working the state Saturday for get-out-the-vote efforts, including unions, social and fiscal conservatives and gay rights groups. Early voting ends at 1 p.m. in all counties. WASHINGTON (AP) — The State Department on Friday released a 2009 email chain that shows then-Secretary of State Hillary Clinton forwarding to her daughter material that the department classified last year. At issue is a December 2009 email that President Barack Obama's trade adviser, Michael Froman, sent to senior White House and State Department staff members. After it made its way up to Clinton, she sent it to "Diane Reynolds," an email pseudonym for Chelsea Clinton. KEENE, N.H. (AP) — New Hampshire Republican U.S. Sen. Kelly Ayotte (AY'-aht) is targeting students with Facebook and Instagram ads playing off Chelsea Clinton's visit to two college campuses. Clinton is the daughter of former President Bill Clinton and Democratic presidential nominee Hillary Clinton. She was campaigning for her mother at Keene State College and Dartmouth College on Friday. Ayotte's campaign ran online ads in those areas, saying, "Going to see Chelsea Clinton today? Click here." AURORA, Colo. (AP) — With a week to go before the final day of the election, the presidential campaigns are working hard to turn out the vote in Colorado. Chelsea Clinton is visiting Colorado to campaign for her mother and urge voters to return their mail in ballots. She's scheduled to visit the Martin Luther King Jr. Library in Aurora at 6 p.m. Tuesday. On Wednesday morning, she'll visit a campaign office in Boulder. EAU CLAIRE, Wis. (AP) — GOP presidential candidate Donald Trump, his running-mate Mike Pence and Democratic vice presidential candidate Tim Kaine are headed to Wisconsin. Trump and Pence are scheduled to hold a rally Tuesday in Eau Claire. Kaine is set to appear in Appleton and Madison that day in support of Democratic nominee Hillary Clinton. AURORA | Chelsea Clinton is coming to Aurora Tuesday evening to kick off phone banks for her mother and the Hillary Clinton campaign, according to campaign officials. Chelsea Clinton is slated “lay out the stakes of November’s election and discuss her mom’s vision of an America that is stronger together, with an economy that works for everyone, not just those at the top,” Hillary for Colorado campaign officials said in a release.